At SasteGhar, we don't believe in selling, we understand your requirements and offer customized solutions. Our real estate professionals work for you and take accountability for the projects we sell. We are consistent in our actions and ensure we deliver what we commit. We believe in transparency, commitment and exceeding your satisfaction. » Send you monthly updates on construction. » Help you get your property registered in your name. To market properties with ethics, transparency and honesty. The company strongly believes in educating customers and working from their side than from builder's side. Our aim is to create a new trend and only promote projects after careful in-depth study of - registry documents, approvals from relevant authorities and credibility of the builder. 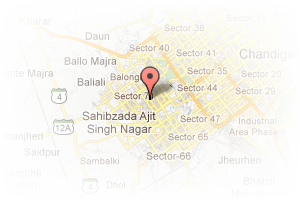 Address: Sco 6, 2nd floor, Sector 68, Mohali, Chandigarh, India. This Broker Profile page for "Saste Ghar" has been created by PropertyWala.com. 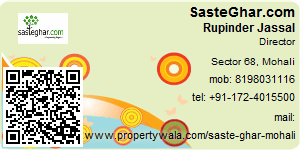 "Saste Ghar" is not endorsed by or affiliated with PropertyWala.com. For questions regarding Broker Profiles on PropertyWala.com please contact us.